Video is fast becoming one of the most important areas of production - from corporate presentations to concerts, using projectors, cameras and screens are now synonymous with 'professional presentation'. Since video is such a new medium, it's hard to find professionals that know how to use it properly. 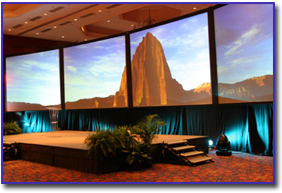 However, the professionals at Performance Production Services, Inc. are well-versed in the use of cameras, projectors, switchers, and Plasma displays. Whether you are planning a private party or a full-scale corporate presentation, contact us to get a vision of what we can do for you.